Why are probes that tend to explore outer system always launched to go outwards instead of straight upwards or downwards? Let's take a look at the trajectory of variety probe missions. I wonder, why all these probes tend to explore outer system were launched to go outwards of the ecliptic plane instead of go upwards or downwards? What I'm talking about here is go upwards or downwards that is considerably closer to 90 degrees. I was told the ecliptic plane of any solar system tends to stay relatively uniform, with only Kuiper Belt Objects (KBOs) showing bizarre inclinations. The closest thing we'd find "below" the Earth would be an Oort Cloud object or outer star system, is it accurate to say so? What would we find if we go straight upwards and downwards? 1 Nola Taylor Redd, Space.com Contributor, January 2 2019, NASA's New Horizons Just Made the Most Distant Flyby in Space History. So, What's Next? Starting out from Earth, you have the free 30 km/s from Earth's movement around the Sun, which is in the plane of the ecliptic. To get far out of the plane you either have to boost a similar amount "up" or "down" (which is beyond the capability of current rockets) or go via one of the gas giants, and use its gravity to change course. So at least to start with you don't really have a choice. One example of using a gas giant to change plane was the Ulysses probe, which, although it only barely got into the Outer Solar System, did orbit at almost 90 degrees to the ecliptic (80.2 degrees, in fact) in order to get a look at the North and South poles of the sun and the radiation and magnetic fields coming from them. 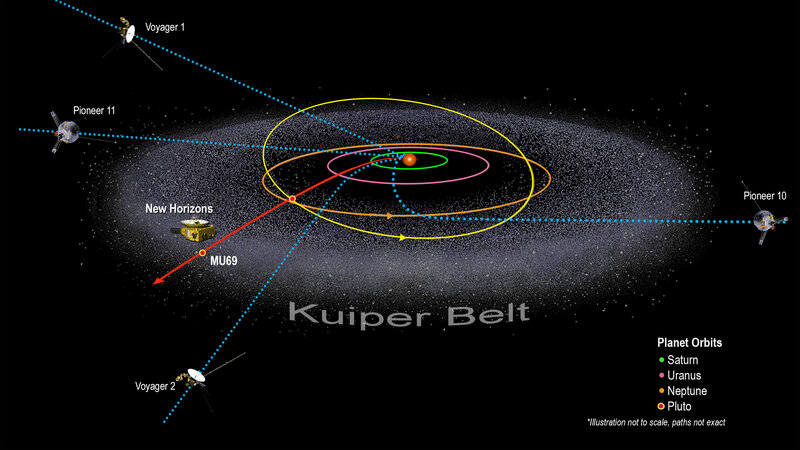 We've had 5 flyby missions to the outer solar system so far. All of them had primary missions at one or more planets. That set the main constraints for their trajectories. Anything after the last planetary encounter was secondary. You also see Voyager 2 now has a significant angle relative to the ecliptic. What would we find if we go straight upwards and downwards? There are almost no targets of interest outside the ecliptic. No planets or other bodies we can visit until you get to the Oort cloud, which is 1000 AU out (10x further than the Voyagers are now after 40+ years of traveling). The only reason to choose a trajectory perpendicular to the ecliptic, is to have another measurement point for the solar wind. But spending an entire mission to 100 AU on just that would be expensive for very limited return. A study for an interstellar mission is underway, but that too is planned to include a KBO visit so it'll be constrained to the ecliptic. It is important to realize that space probes aren't really useful for finding objects in deep space. Space is so empty that a probe sent in a random "exploratory" direction would have a negligible chance of detecting an object orbiting the sun. The best way to find objects outside the ecliptic is to look for them using really large Earth-based or orbital telescopes. And there doesn't appear to be much out there. All of the probes on their way out of the solar system were meant to explore current or former planets, which are all close to the plane of the ecliptic. That really is the reason the probes are close to that plane. It would be of interest to sample the far reaches of the Sun's magnetosphere in different directions, but it hasn't been judged worth the expense. But in essence there is no reason to not use such maneuvers for additional acceleration and as mentioned before going perpendicular to the plane would require propulsion systems we don't have (yet). Even if we had such technology, there is still no reason to not use that free energy anyway, since these probes have no specific destination. A separate point - there's a degree of circular reasoning. Humanity can't see much of anything interesting outside the plane yet near enough to visit, so we don't go there when there are far bigger and more exciting things in/near the ecliptic plane. So the upshot is we haven't had a closer look. Probes cost money and without a defined set of mission goals that show a useful purpose, then the money goes to the more interesting proposals. Who knows what science might learn by shooting a generic probe straight up or down? Answer funding money comes easier when there's an interesting purpose. Mostly because launching upwards would be useless to us, as we have extremely limited deep space travel capabilities. Besides that; all rockets are launched along our equator anyways, the pull and movement of the Earth allows for an easier launch, and if we launch along our familiar plain we are able to utilize gravity assists from other celestial objects. Gravity assists are a big reason, they give a huge boost to the rocket being launched and they give a flyby opportunity (great for research). Not the answer you're looking for? Browse other questions tagged probe planetary-science solar-system or ask your own question. 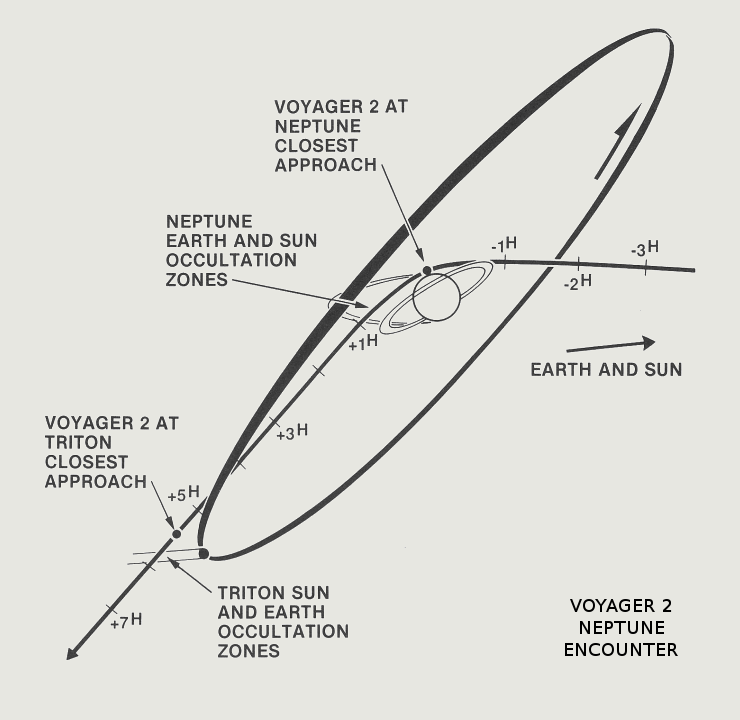 Why did Voyager 2 receive a gravitational slowdown (as opposed to a slingshot) at Neptune? Are there any successors to Voyagers underway currently? Is there any reason to send space probes along the plane of our solar system instead of perpendicular to the plane of our solar system? Are there any gas giant probes planned that will return images or video? Are multiple sub-probes feasible for fast flyby missions to outer Solar System objects? How much do we know about minerals and raw materials that are in our solar system? Why aren't space probes launched in batches? Why didn't New Horizons stay in Pluto's orbit? Why aren't deep-space probes launched from space? Why are space probes and satellites not destroyed by meteor showers such as the Perseid?